After doing much psychological and spiritual work throughout the Rachel's Vineyard weekend, one of our closing rituals is a memorial service. This is a unique, beautiful opportunity to give honor and dignity to your lost child. 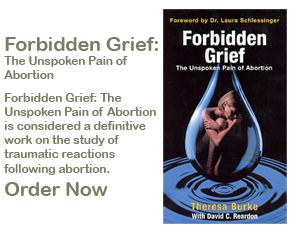 Since your baby was lost because of an abortion, it's likely that you have never been given permission to grieve the loss of your child. Because of the nature of such a pregnancy loss, the tiny body of your baby was never held or buried. It is every mother's need to grieve the loss of her child. Likewise, it is every father's privilege to express connection and attachment through his grief. The Memorial Service is a special ceremony where you can give dignity to the eternal life and memory of your child in heaven. It is a time to bring a precious bereavement doll and placing this symbol of your child to rest in a cradle. It is also an act of entrusting the soul of your lost child to God. It is a ceremonial ritual of letting go and placing your baby in the arms of the Creator. The service will also include an opportunity for you to read a poem, share a letter, or sing song or any artistic expression you choose to commemorate and express your connection to your baby. The Memorial Service is a special, private occasion. It is our hope and prayer that as you go on with your life that this moment will mark a special place in your history, the day you gave honor, respect, and dignity to your unborn child.